Flintshire council has voted to support newspaper sellers who refuse to sell The Sun. The authority was asked to back a national campaign to try to stop the sale of the newspaper over its coverage of the 1989 Hillsborough disaster. The motion was carried by 36 councillors to six, with 18 abstentions, at a meeting on Wednesday. The Welsh Conservatives said the move was "typically spiteful". The motion, put forward by councillors Bernie Attridge and Kevin Hughes, asked the council to support the Total Eclipse of the Sun boycott campaign "in solidarity" with councils in England. It read: "We express our support for those affected by the disaster and commend the continuing efforts of relatives and friends of the victims in their search for justice. "We condemn the behaviour of The Sun newspaper and we as a council will support any Flintshire retailer or newspaper vendor that choose not to sell The Sun newspaper. " Mr Hughes told the meeting the motion was being brought now because last year an inquest ruled the 96 people were unlawfully killed. Some councillors raised concerns saying people were capable of making their own minds up. But leader Aaron Shotton said it was about "showing solidarity and a recognition of the hurt". Liverpool council has already called on retailers to stop selling The Sun, following its coverage of the tragedy in which Liverpool 96 fans were killed. 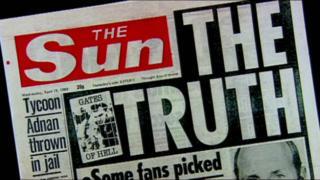 The newspaper and the editor at the time of the Hillsborough tragedy have previously apologised for the coverage. Welsh Conservatives' local government spokeswoman Janet Finch-Saunders said it was an "attempt at full-on state censorship of the media" which could lead to the council being taken to court. "Whilst we might not like certain newspapers - and might question the impartiality of other platforms - we have a right not to consume their output. But we shouldn't have a right to ban them," she said.